In a corporate setting. I am attempting to update Captivate and I am receiving the following error message. Can someone tell me what this means? My version is something like 10.0.3 or something like that. This version definitely seems like an upgrade and according to the notes will resolve an error that I am experiencing. I have attempted to manually update Captivate and receive the same error message although it doesn’t go through the entire process of downloading and installing before I receive that error. I know you are not but I am speaking to both him and you. No it is not a Mac. The user is running Windows 10. Hi, The solution to this is that you need to Reinstall Adobe Captivate and make sure you are at version 10.0.0.192. Thereafter you can update to 10.0.1.285 with no issues. The version you are at is an intermediate version and to install the latest update it is a pre-requisite to have base version installed. Strange, you must have installed a lot of hotfixes. See that Mayank tells the same. Can I just download that version from the web? I attempted to remove and reinstall the version saved on our sharepoint and it is the 10.0.0.236 version. Will my corporate key need to be updated? Is there a direct link that I can use instead of filling out all of that company info? I am not Mayank, but it looks like you are on a Mac, right? I heard from other Mac users that you should roll back to the original version 10.0.0.192 to be able to install the full patch leading to 10.0.1.285. Mayank_M that did not resolve the issue. I have attached a picture of the current version on the users PC. Mayank_M – I have an appointment later today with the user and will attempt your suggestion then. I will let you know the results thank you. Leive – I will have to wait and get with the customer to check the version again but I want to say for sure that I saw something like 10.0.0.3 or something to that affect. I do have administrator rights and have an appointment with the user this afternoon to try and get her issue resolved. And it being a government environment I am sure we are behind a firewall. Can you try the below steps and check if this works? 2. Rename OOBE folder to OOBE_old. 4. Try to update Captivate again. 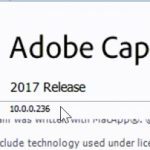 Can you check the exact version number under Help, About Captivate please? The first release of 10 was 10.0.0.192, the most recent one is 10.0.1.285. Do you have Administrator rights? Are you behind a Firewall? I have 2 team members that are unable to update from Captivate 10.0.0.192 to 10.0.1.285. They are both on Windows 10 and have Administrator rights. Both get the same message. “Your applications are all up-to-date” I have confirmed that they are doing this correctly and are still on the older version 10.0.0.192.